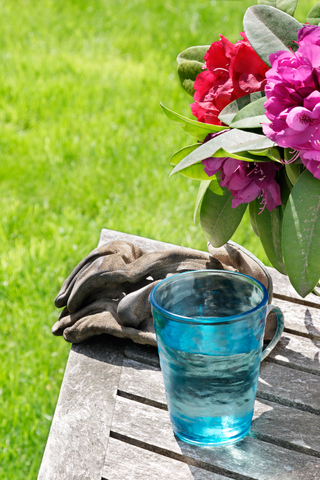 Gardening and yard work are the main causes of back and/or neck pain during the spring and summer months. The good news is that this discomfort is preventable. Gardening should be considered as another type of exercise. Warming up before digging, and using the proper techniques and tools will help promote pain-free gardening activity. Take a 10 minute walk to warm up your muscles. Do some gentle stretching but do not bounce or strain while doing warm up stretches. Stand close to the load to be lifted. Keep your back straight with your feet and body pointing in the same direction. Use the strength of your leg and arm muscles to slowly lift the load. Avoid heavy lifting immediately after bending or kneeling. Alternate your tasks between heavy chores such as digging and lighter, less physically demanding tasks such as planting. Stand with one leg forward and one leg back when you rake, dig, or hoe. Switch legs and hands every few minutes. These are very unilateral movements so switching sides is important to maintain a balance to the stresses put on the body; just think of gardening like a workout. Be sure to kneel while planting or pulling weeds. Otherwise you’re putting unnecessary stress on the low back articulations. Use knee pads or a kneeling mat to minimize the stress on the knees but again, change positions frequently- at least every 15 minutes. Move from kneeling to standing, from digging to planting etc., just like a circuit training. Pace yourself! A minimum of three brief breaks each hour is recommended. Take a few moments to move around, stretch your muscles, have a drink of water or simply sit and relax. Spread the work over several days or do an hour or two in the morning and again in the afternoon instead of doing it all at once- your back will thank you! Use the right tools for the job. Look for ergonomically designed tools with padded handles. Use long handled tools to help you avoid bending and twisting as you work. Your spine should be aligned. Maintaining good posture and spinal check-ups can help keep you in shape. Take care of your back; back or muscle pain that lasts longer than 48 hours is your body’s way of saying it needs help. Chiropractic doctors can help you detect and treat spinal problems and provide care for your back, muscles and joints. By Scott Oliver DC, BKin, June 2013. Scott is available for public speaking for your business, group, or organization.